The Department of Arabic Language and Literature provides students with an in-depth knowledge of Arabic language and literature in order to enable them to work in the fields of their specialization with competence, and to pursue advanced studies. 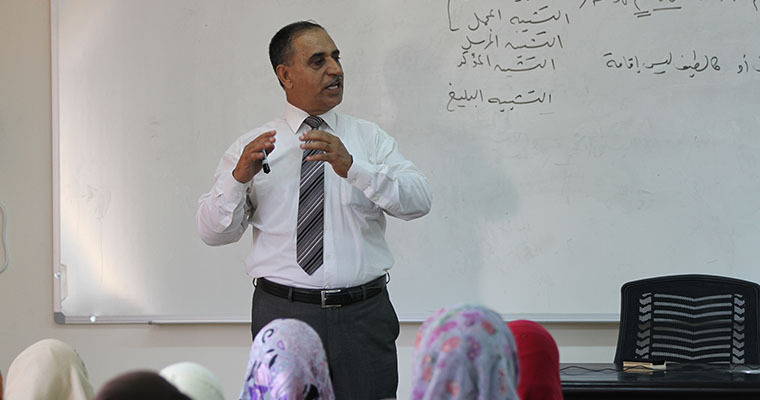 The department offers a major program of study leading to the bachelors of Arts in Arabic Language and Literature. The department also has minor in Journalism. The department adopted its master's program in 1995. The department's vision crystallizes on raising students’ adequacy in the Arabic language, the language of religion and Arabism. It seeks to meet the Palestinian market needs and provide it with the competencies. The department goes along with the vision of modern education which is based on integrated education and extracurricular activities. To enhance the students' knowledge in Arabic literature and linguistics and reinforces the use of standard Arabic in speaking and writing. To assign a distinguished team of professors in the various branches of Arabic who graduated from local, Arab and foreign universities. To communicate with local, national and international Arabic professors to benefit from their experiences.